Students research rotational acceleration, moment of inertia, angular velocity, and other concepts with this complete kit. Mount an object directly on the cross-shaped platform with lightweight aluminum support to keep its moment of inertia low. 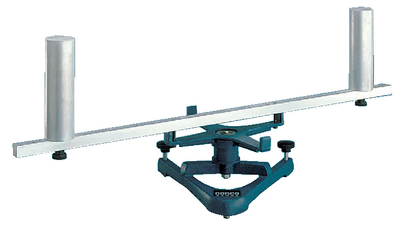 The platform carries a torque drum with smoothly rotating ball bearings. Less than 5 g are needed to start the drum rotating. The long, aluminum support bar of this apparatus measures 86 cm and clamps onto the rotating support with a pair of included thumbscrews. A series of holes down the length of the bar lets you attach the provided pair of nickel-plated 2.5 kg masses to any of seven different radii. The kit also includes a ball-bearing table-clamp pulley and complete instructions for studying the principles of rotational motion and inertia, angular momentum, and energy.